I usually paint from photos I take myself, but sometimes someone I know takes a photo that I find so inspiring that I ask permission to paint from it. My sister Nancy, who lives in Italy, recently took a trip to Slovenia and visited Lake Bled. She took a stunning photograph of the lake and the beautiful cathedral on the island in the middle. The surrounding mountains were shrouded with clouds, but the sky above was blue. This made for beautiful reflections in the water. On the distant shore stands another church. Anyone interested in following Nancy’s adventures as an American ExPat in Italy should read her blog. 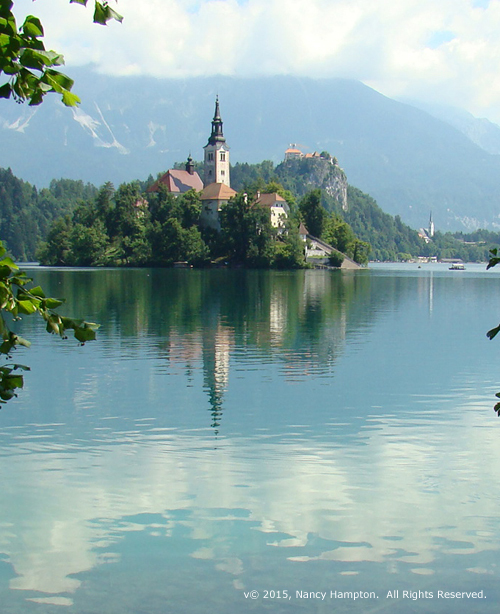 Here is Nancy’s photo of Lake Bled. I cropped it to get the scene and composition I wanted. The nice thing about this photo is that it’s portrait orientation. As a landscape painter, most of the scenes I paint are landscape orientation. Many are panoramic – I like painting in a footprint that is twice as long as it is tall. We have this electrical box in the hallway just inside the front door of our condo in Northern Virginia. It’s ugly and I’ve been wanting to cover it up but it requires a portrait orientation painting that is fairly large. I had an 18×24 inch board that I thought would be perfect for the job, and Lake Bled would look beautiful there. The painting was challenging. I wanted the star of the show to be the island in the middle, with its contrasting green trees and red roofs. I also wanted to capture the image of that reflecting in the water. This was very challenging but a lot of fun. The water was not still, so I had to capture the ripples with a series of small horizontal brush strokes of the varying colors. These also had to fade to the white of the clouds and ultimately the blue of the sky. There are actually four different sections of color in the water in addition to the image of the island. The area near the distant shore is almost white, the gray-blue reflection of the mountain, the white/gray cloud layer on top of the mountain, and finally the bright blue sky. Interesting that you can only see bits of that in the photo, but it’s evident in the reflection. I actually broke my engineer brain’s connection to reality when I was painting this. I was focused on shapes and colors and didn’t realize the sky above was blue until I stood back and looked at the almost finished product (below). I am very pleased with this work. It’s one of my best efforts to date. Alas, it may not hang in the hallway at my condo, but that’s a good thing. A few weeks ago I was at work. My office is a gallery of paintings I don’t have room for. I also like them because they remind me of my other life – what I’d rather be doing. 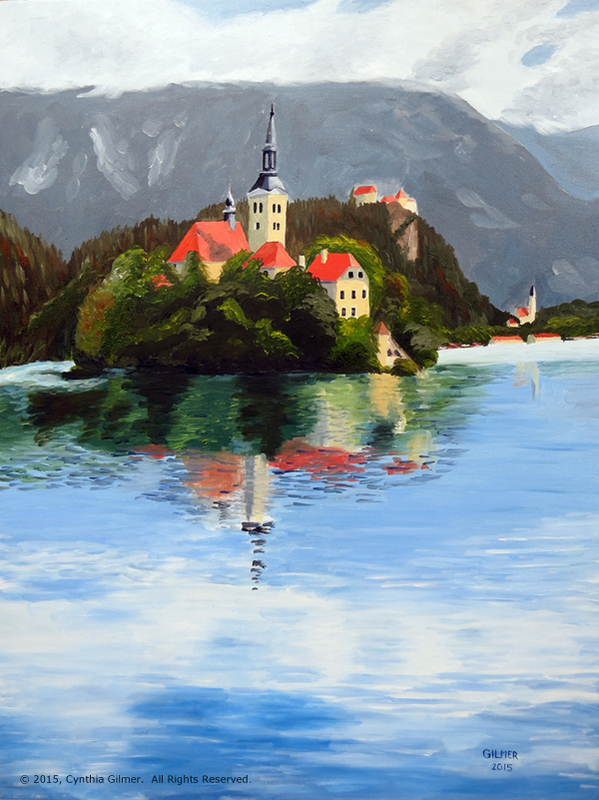 I was talking to Catherine, a colleague and she asked, “How can someone buy one of your paintings?” I laughed and said “They’re all for sale!” We continued talking and I mentioned that I was working on a painting of Lake Bled. She announced, “I want to buy that one!” As it turns out, Lake Bled was the destination of Catherine and her husband Mike’s first overseas trip. She is looking for a unique gift for his November birthday and decided this painting would be it, sight unseen. I shared a photo of the partially finished painting. She still hasn’t seen it, but now that it’s done I’ll take it into work this week and if she likes it in person, it will be sold. Fingers crossed. I’ll post an update with the final result. One of the things I’ve learned in my short artistic career is that people buy art for personal reasons. Usually they choose a painting because it touches them emotionally in some way. There is really no way to plan for that. I paint for myself, and hopefully along the way my art will touch others as well. Update: Catherine did indeed buy the painting and she loves it!